Thursday 17 October I had a a 21:45 flight from Heathrow T5 so got a taxi straight from work. It was great to be able to sit and relax in the Concord Room prior to the flight. The flights I've racked up of the past couple of years have spoilt me… I'm not sure I'll be able to go back to economy! The flight was really comfortable and I even slept through breakfast prior to landing. Friday 18 October I recalled that the FX rate offered by Travelex in Mumbai airport had been surprisingly good, however this time seemed to be rather different and I ended up with a rather large spread… oh well! 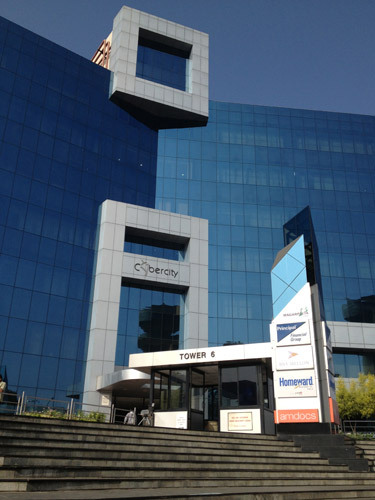 It was a short taxi ride from the airport to the Hyatt Regency and I arrived by lunch time. During my last trip to India in 2012 I hadn't taken the opportunity to spend any time in Mumbai, this time I decided to spend 2 nights there, giving me one full day for sightseeing. After checking in I unpacked, freshened up and relaxed in my room with a book. 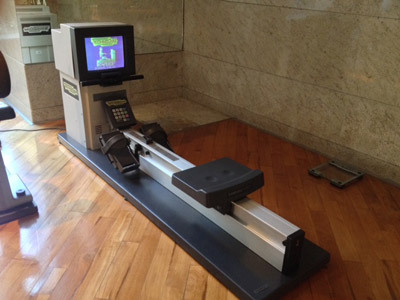 I paid a quick visit to the gym and had a real blast from the past with this Technogym rower. I don't think I've seen one of these in nearly 20 years. I think that's a working BBC micro too! By 7pm I was sat at the STAX restaurant bar with the Italian veggie set menu. After getting back to my room I found it really hard to stay awake! Saturday 19 October I was up early for breakfast and a my tour of Mumbai. After some initial confusion amongst the reception staff, my guide soon appeared and we were on our way. My guide for the day was Mala Bangera. During our journey into Mumbai we discussed the places I wanted to visit. 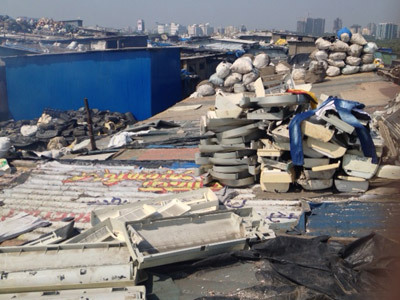 As we drove along the freeway we passed a number of the Mumbai slums and Mala recommended I go on a 2 hour 'slum tour' before returning to the hotel. The first of the 'sights' was the Bandra–Worli Sea Link (officially called Rajiv Gandhi Sea Link), a suspension bridge that bypasses the Western suburbs of Mumbai, cutting about 30 minutes from our journey time. 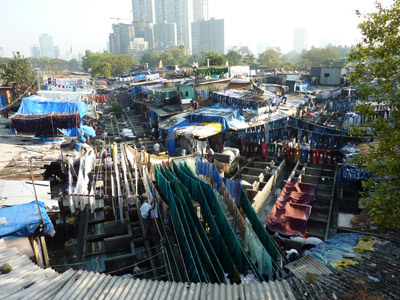 Our first stop on the tour was the Dhobi Ghat or "Open Laundry". The "Dhobi" are the traditional laundryman (a hereditary occupation) who collect dirty linen from households around Mumbai. Almost two hundred dhobis & their families work together. Washing is completed by the men and taken inside to be ironed by the women. Clothes are returned to their owners a week later for a small fee. 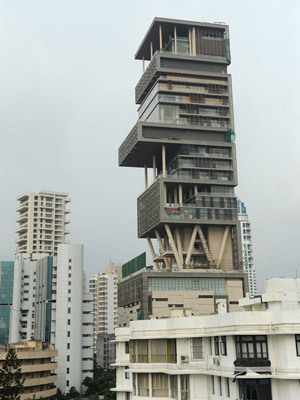 During our journey through South Mumbai we passed by Antilia - the most expensive house in the world. Once I'd seen it I recalled reading about it in the papers. My driver referred to it as 'the money house'. The Hanging Gardens of Malabar Hill were laid out in 1881 and take their name from the fact that they are built on top of the reservoir that supplies water to South Mumbai. 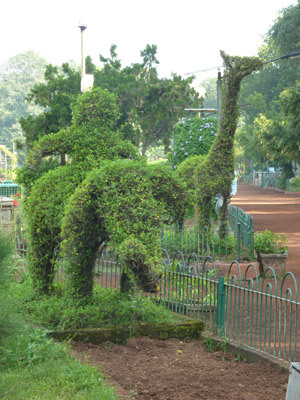 A number of the bushes are shaped like animals. From here I could see a large part of Mumbai, including the Antilia. 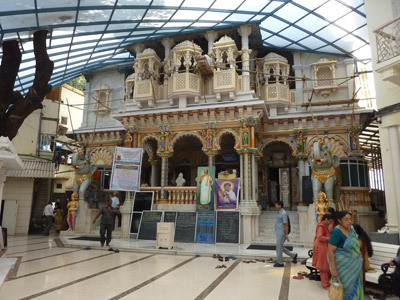 Our next stop was the Babu Amichand Panalal Adishwarji temple which is part of the Jainism religion. Mala was keen to point out that the temple was heavily decorated with silver and gold and that the members of the religion are often very wealthy. Mala insisted that many of the doors and decorations were made of solid silver but you could see that it was simply wood painted silver. 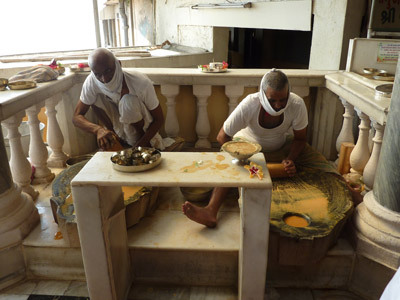 Two men rubbed blocks of sandalwood against stone slabs to create a paste used to mark your forehead and decorate ornaments within the temple. 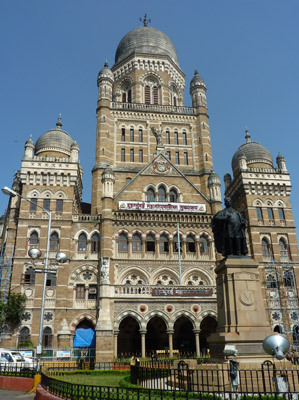 Victoria Terminus, recently renamed as Chatrapathi Shivaji Terminus is an extravagant building constructed by the British in 1878 and now declared a heritage building. It's reminiscent of London's St Pancras Station. Crawford market used to be the city's wholesale produce market but this has now been moved to New Bombay. 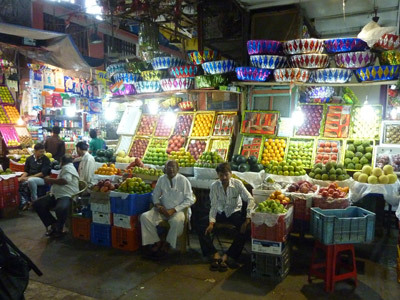 Today it is where central Mumbai shops for its fruit, vegetables, anything & everything. 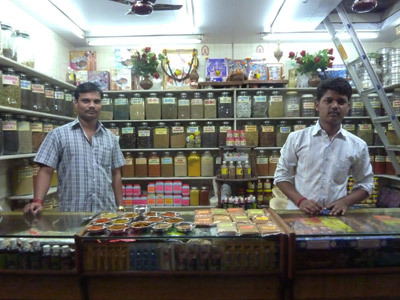 Mala told me of how, over the past 10 years, the shops have slowly been 'westernised' with fruit and vegetable stalls being replaced with vendors of chocolates, perfumes, deodorants and household supplies. I was taken to a stall selling a massive array of spices. The guy behind the counter poured out a huge range of spices in front of me, getting me to smell each one in turn. By the end I felt a little bad not buying anything so picked up a packet of Green Curry powder - it did small good after all. 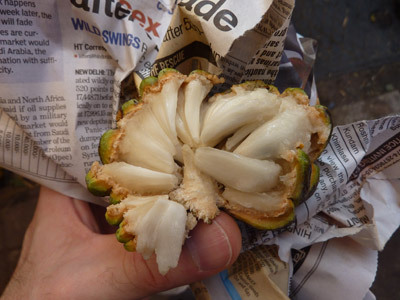 Mala obtained a custard apple for me from one of the stalls - it tasted very good and was surprisingly easy to eat! 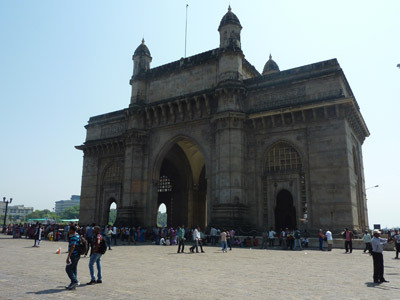 The Gateway to India is the first landmark of Mumbai/Bombay. It was built to commemorate the visit of King George V & Queen Mary to India in 1911. 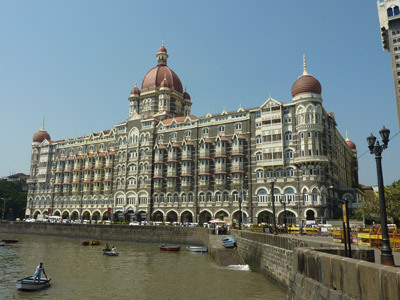 The site also gives you a view of The Taj Mahal Palace Hotel - one of the locations of the 2008 Mumbai terrorist attack. 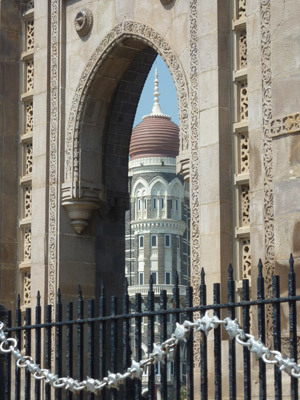 A view of The Taj Mahal Palace Hotel through The Gateway to India. The final stop on the tour was a small tourist shop that had previously been visited by Bill Clinton (there were a number of photos up on the wall). From here, Mala left me with my driver and we made our way back towards the hotel. We drove back along the water front. Marine Drive (officially named Netaji Subhash Chandra Bose marg), was built on land reclaimed in 1920. It runs along the shoreline of Backbay starting at Nariman Point. At night, the stretch seen from an aerial view seems to form a necklace of diamond hence, this place is also known as Queen's Necklace. As we drove along the coastline we also passed the Haji Ali Dargah, a tomb built in the 18th century and dedicated to saint Haji Ali. It's located in the midst of the sea and accessible by foot thru a causeway only during low tide. We also passed the hanging gardens and drove back over the suspension bridge. I met Sonil (Sunny), my guide for a slum tour at Cafe Day, a coffee shop located just a short distance from the highway. He guided my driver to a spot where we could start the tour through Dharavi, the largest slum in Mumbai and indeed in the world. The slum was not what I had expected. I felt perfectly safe during this tour, and was more than a little surprised that the area didn't smell. I had expected to see countless people hanging around and doing nothing, however it was actually a real hive of activity. Recycling was a key activity. I saw many people handling plastic - from sorting to shredding, washing and finally melting down. I was also shown a aluminium being shredded, melted down and reformed into 6kg bars. The workers were not wearing any protective clothing and it was clear how dangerous it would be to spill the molten aluminium. In addition to recycling I also saw teams producing leather goods and baking bread and cakes. Sonil took me into one of the houses and guided me up a set of stairs and on through a hatch in the roof. 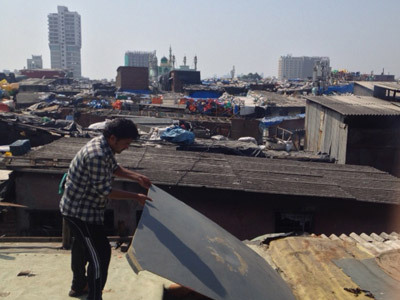 This gave us a good view over the slum and across Mumbai. Sunday 20 October Another large breakfast before checking out and meeting my driver for the 3.5 hour journey to Pune. After checking into the Westin, I unpacked and paid a visit to the gym. I spent a few hours relaxing then went for dinner at Prego, the hotel's Italian restaurant. Monday 21 October I only just managed to fit in a trip to the gym before breakfast (which finished at 10:45). At 12:30 the hotel arranged for a taxi to take me to the office for my first day with the team. There were quite a few formalities to go through before I could access the floor - even more than on my last visit! First of all I had to provide ID and sign in at the security hut outside the building, I then had to go through the same process at a reception on the second floor of the building. We then had to proceed to the fifth floor to go through the same process however the security guard was very unhappy about allowing me to keep hold of my mobile, blackberry and laptop. Chandra had to send an email to the security team for authorisation before I could access the floor. I arranged for the hotel for a taxi to collect me at 21:30 that evening. After getting back to the hotel I was still feeling rather awake so I paid a quick visit to the gym before going to bed. Tuesday 22 October I managed to get up a little earlier and as a result was in less of a rush to get to the gym before breakfast. Wednesday 23 October I felt too tired to hit the gym in the morning so decided to have a lie-in. After breakfast I spent a little time reading next to the pool. That evening we left work a little early and went to Deccan Harvest, a restaurant located in the centre of the Cybercity roundabout. It was great to spend time with the team outside of work. 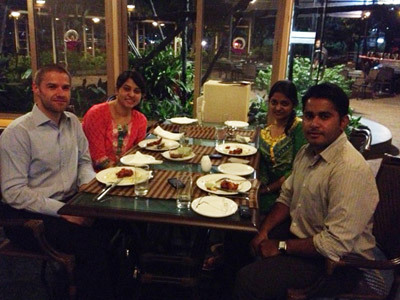 This is a photo of me with Mayuri, Tuhina and Swapnil at Deccan Harvest. Chandra joined us a little later. We had a lot to eat - I was far too full to go to make it to the gym afterwards! Thursday 24 October We managed to take some time out of the office during the UK lunch period and visited the Seasons mall, then the Amanoro mall which were located just a short distance from the office. The team treated me to a coffee and some very nice cakes! Friday 25 October Last day in the office. The team were very kind and gave me a number of gifts to take back to the UK - presents for me, Cathy and also lots of treats from a local bakery for the rest of the team! Saturday 26 October A really early start for a 5am taxi back to Mumbai. After the issues I had experienced trying to get into the airport at the end of my last trip, I was sure to have a printed copy of my ticket in hand. There were no such issues this time! I had some spare currency for the airport, just in case they were going to spring any last minute airport taxes on me (they didn't). Although there appeared to be many signs in the duty free area stating that only holders of Indian passports could pay in Rupees, I still seemed to be allowed to spend the last of my money.